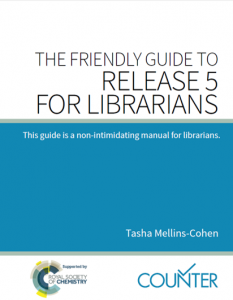 Hot of the press, written by Tasha Mellins-Cohen, this guide will help librarians prepare for Release 5 of the COUNTER Code of Practice. This publication provides a wealth of information about the new Metrics, Master Reports and Standard Views. It also provides a helpful section which maps the key Release 4 reports to their Release 5 counterparts. You will also find several user scenarios, that come together in a set of COUNTER Release 5 reports. You can download the guide here in PDF format, or request a print copy from Compliance@counterusage.org. Thanks to the Royal Society of Chemistry for sponsorship which made this guide possible.